Reading and share top 8 famous quotes and sayings about Dashed Hopes by famous authors and people. 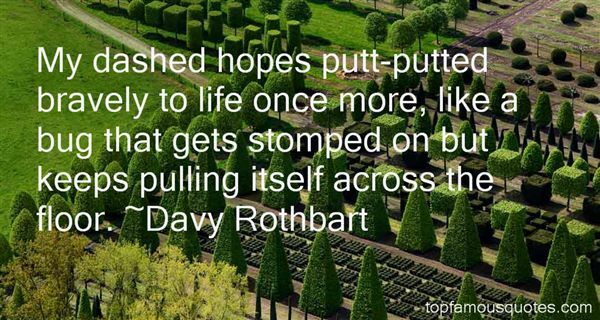 Browse top 8 famous quotes and sayings about Dashed Hopes by most favorite authors. 1. "My dashed hopes putt-putted bravely to life once more, like a bug that gets stomped on but keeps pulling itself across the floor." 2. "I am crying over the loss of something I never had. How ridiculous. Mourning something that never was – my dashed hopes, dashed dreams, and my soured expectations." 3. "Dashed hopes and good intentions. 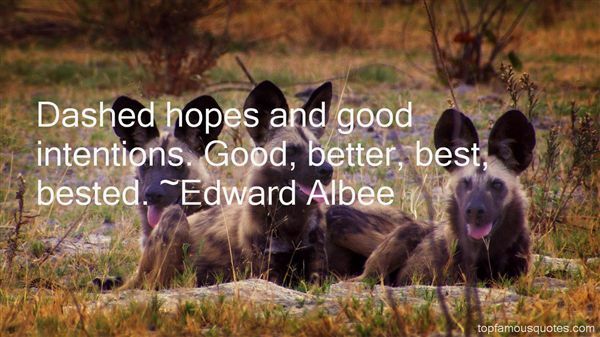 Good, better, best, bested." 4. "You...you've been here quite a long time, haven't you?"What? Oh...yes. Ever since I married What's-her-name. Uh, Martha. Even before that. Forever. Dashed hopes, and good intentions. Good, better, best, bested. How do you like that for a declension, young man?" 5. "Evangelicals sometimes expect too much or, to put it more precisely, we look for a kind of change God hasn't promised. It's possible to expect too little, but under-expectation is usually a cynical reaction to dashed hopes for too much. We manage to interpret biblical teaching to support our longing for perfection. As a result, we measure our progress by standards we will never meet until heaven." 6. "Here are all these people, full of heartache or hatred or desire, and we all have our troubles and the school year is filled with vulgarity and triviality and consequence, and there are all these teachers and kids of every shape and size, and there's this life we're struggling through full of shouting and tears and fights and break-ups and dashed hopes and unexpected luck -- it all disappears, just like that, when the choir begins to sing. 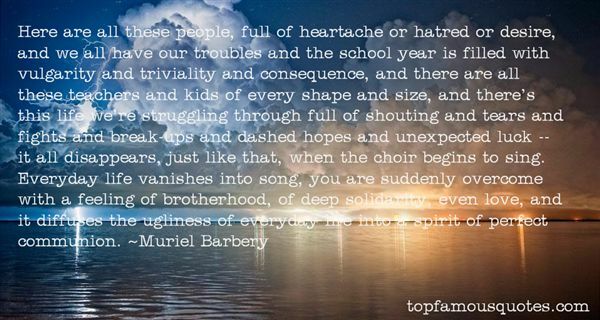 Everyday life vanishes into song, you are suddenly overcome with a feeling of brotherhood, of deep solidarity, even love, and it diffuses the ugliness of everyday life into a spirit of perfect communion." 7. "The day's dashed hopes had temporarily reduced her to the childish presumption that someone she loved should, in return for that love, be able to read her mind." 8. "From open sea she's chosen meand dashed the hopes of many.A life with her is worth the hopesmy love for her may bury." My favorite action movie growing up was 'Supergirl.' It wasn't good by any stretch of the imagination, but it was my favorite because I wanted to be her. I have a Supergirl tattoo."